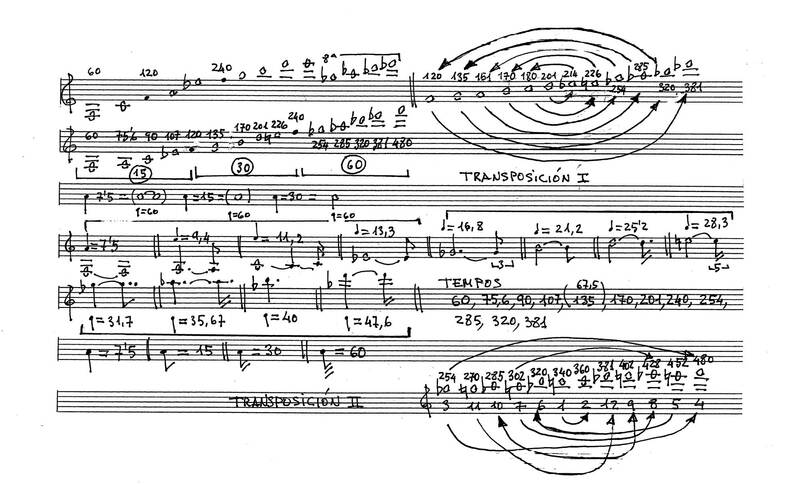 Horizonte ondulado illustrates the application of the creative thinking of Madrid composer José Manuel López López (1956), of a personal and suggestive poetic and sonic imagination, to the timbral and dynamic potential of percussion instruments and their implications in the temporal dimension of the musical material. This album, performed by the Valencian percussionist Miquel Bernat and the Portuguese ensemble Drumming, is the upshot of many years’ collaboration between López López and Miquel Bernat, and reflects a process of creation in a close partnership which has enabled the composer to develop complex aesthetic aspects impossible to accomplish without direct, continuous work with the performer. José Manuel López López was involved with the works, whose interpretative demands are within the grasp of very few, throughout the recording and post-production, conceived in stereo, 5.1 surround sound and 3D formats for sound installations. This album, performed by the Valencian percussionist Miquel Bernat and the Portuguese ensemble Drumming, is the upshot of many years’ collaboration between López López and Miquel Bernat, and reflects a process of creation in a close partnership which has enabled the composer to develop complex aesthetic aspects impossible to accomplish without direct, continuous work with the performer. José Manuel López López was involved with the works, whose interpretative demands are within the grasp of very few, throughout the recording and post-production, conceived in stereo, 5.1 surround sound and 3D formats for sound installations. 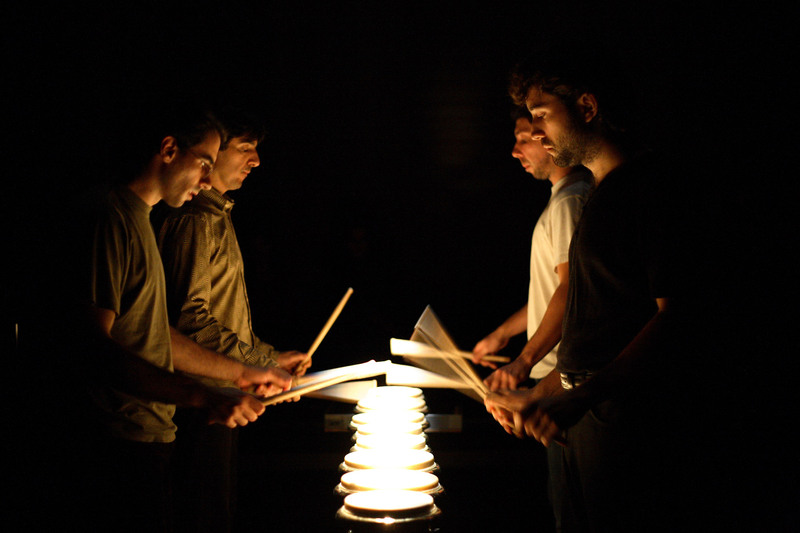 In Haikus del mar (Sea Haikus) (2010) for six percussionists, a French State commission for Les Percussions de Strasbourg, a polyphony is heard immediately which continuously superimposes macro and micro-temporal relations. The initial explosion of resonances and sound reflections, the image of a vast refracting plate, the sea, lit by the sun, seeks to create synaesthesia between the luminous reflections and the resonances of glockenspiels, vibraphones, bar-chimes, triangles, jingle bells, ocean drums, güiros and other instruments. The work is borne on an immense network of principal times, their associated relative times connected by a system of metric modulations which, like time tunnels, take us from extremely slow temporal situations (where time stops, evoking a calm sea in which apparently nothing happens) to extremely intense, agitated and complex temporal states. Of particular interest in this and subsequent works is the macro-articulation, created by the silence, which fragments the fractal elements. The constant tempo changes are a characteristic of my output in general, conceived among other things to modify the micro-textures of hundreds of resonant bar and metal particles, or the dry ones of woods and skins, producing what I call Metric Granulations. These sonorous situations, calculations and mathematical relations are simply a reflection of poetic images drawn from Japanese haikus about the sea, which help me to submerge myself in a sonic landscape hard to conceive in any other form, and which I emphasise with the movement in the acoustic space created by arranging the six players in a circular pattern. This is a discursive logic and a language on the border between science and poetry, synaesthesia as pointed out above that perfectly reflects my deepest personal and artistic concerns. Haikus del mar is dedicated to Les Percussions de Strasbourg –Keiko Nakamura, Claude Ferrier, François Papirer, Bernard Lesage, Olaf Tzschoppe, and Minh-Tam Mguyen– who premiered it in Montpellier (France) on 12 January 2013. African Winds (1998), originally written for bass clarinet and percussion, was commissioned by Duo Contemporain (Enri Bok and Miquel Bernat). I made two versions: one for saxophone and percussion (2008) and the one in this album for two marimbas and vibraphone, composed in 2005. As in previous works, the quest in African Winds II targets the relation between harmony and timbre. From the opening bars, three figures, of one, two and three pulses, combine between the two players to create a non-linear, highly fragmented and apparently regular rhythmic fabric, but which is not actually like that thanks to a shifting articulation that proliferates in an uninterrupted continuum of semiquavers lasting until the work ends, and articulated as follows: (1+3) (1+2) (1+1), (2+3) (2+2) (2+1), (3+1) (3+2) (3+1). One of the most notable characteristics of this sort of writing, which I have used many times, is the fragmentation of the spectrum into short segments: even at points sometimes situated in regions of harmonics which are consecutive (17, 18, 19, 20, 21, etc. ), close (2, 3, 5, 7, 11, 17, etc.) or in others which are very distant (2, 17, 3, 18, 5, 19, 20, etc.). These brief figures are enlarged and transformed at a given point, shifting from 1, 2 and 3 pulses (semiquavers) to 4, 6, 9, 11, 13 or 17, the last of these always linear, ascending or descending, allowing me to create an intermediate combinatory formal play, inserting the ascending or descending gestures of the correlative harmonics 4, 6, 8, 9, 11, 13, 17, between large blocks of fragmented micro-structures: (1+3) (2+1) (1+1), (3+2) (3+1) etc. Fundamental, (f.2), f.3, (f.4), f.5, (f.6), f.7, (f.8), f.9, (f.10), f.11, (f.12), f.13, (f.14), f.15, (f.16), f.17, (f.18), f.19, (f.20), f.21, (f.22), (f.23), (f.24), f.25. Twelve frequencies integrated and creating a system which is not modal, or tonal, or serial, but timbral-spectral. Thus the musical idea focuses on the sound representation of abstract physical-mathematical thinking, highlighting the physical-acoustical laws of sound. From the formal point of view, the work develops in the framework of an apparently free organic structure; only apparently, because the interest of the organicity lies in a control of the freedom and the balance of all the parameters involved in the composition. I achieve this by constantly listening and re-listening internally to the music already written, to discover and evaluate which of the paths possible at any time interests me to follow. Tinged with diverse colours, dynamics, registers, timbres and forms of attack, the figures referred to above provide the basis for very varied musical situations, giving rise to successions of colours crossing or coinciding in an asymmetrical continuity. This pictorial effect, which creates different depths within the regularity of a texture, enables us in music to obtain different planes and profundities whether in rhythm or in harmony and timbre. In the case of the rhythm, the result frequently evokes thirteenth and fourteenth century hocket techniques of the Ars Antiqua, from the School of Notre Dame, as well as African polyphonies, where a melody or a harmony is shared and fragmented among the various voices in a work. For me, clearly, timbre is the category which is shared and spatialised, the harmonics being those that jump from one player to another, from one voice to another. The outcome is a polyphonic unit at once fragmented yet compact where time, the main protagonist, evolves and binds different dimensions of its multiple essence. When the fabric supporting this structure disappears, we enter a poetic world of musical abstraction and of inexplicable sound images borne by the wind. In VibraZoyd (2012) for vibraphone and electronics –dedicated to Gérard Hourbette and Monique Vialadieu, a 2012 commission from Art-Zoyd: Centre Transfrontalier de Production et de Création Musicales, with Robin Meier as RIM (Réalisateur de Informatique Musical – Computer Music Designer)– I have sought to explore the labyrinths of time and to make the traditional wave paradigm of recent centuries coexist along with the more contemporary granular paradigm, close to the universe of particles (protons, neutrons, neutrinos…), micro-movements and energies. The particular feature of this score is in the exploitation of bow techniques, carried to the extreme, applied to the vibraphone bars with two or four bows, two mallets and two bows simultaneously, or a bow with glissando mallet. The result is a sound very like that of sine waves. My aim in VibraZoyd is to fuse electronic and instrumental sounds, so that they become indistinguishable. Fundamental to the score (apart from the F of 174.61 Hertz –Hz– the lowest on the instrument) is the use of “differential sounds”, pulses that appear when two or more frequencies that are very close together are superimposed; a pulsation emerges from this superposition, sometimes perceptible as rhythm, sometimes as a modification of the timbre of the two frequencies when added to them. These sounds do not in fact exist: our brain constructs them by trying to differentiate one frequency from the other; for example, when an A of 440 Hz is superimposed on another A of 446 Hz, our perception will hear, in addition to those two notes, a virtual rhythm of 6 pulsations per second; by superimposing an E of 1318.51 Hz and an F of 1396.9 Hz (the highest note on the vibraphone) a frequency of 78.4 Hz is obtained which, imperceptible as rhythm because of the speed of the pulsation, is integrated as timbre, modifying the colour of the E and the F. In the work’s first and last sections, each note or notes played by the vibraphone in combination with its “doubles” produced by the electronics generates diverse differential rhythms, from one to seventeen pulses per second. These rhythms sometimes provide reference for metric modulations and changes of overall tempo, and sometimes build polyphonic fabrics that transform constantly, shifting away, approaching, and moving around the listener, placing both the real space (the performer and the hall’s acoustics) and the virtual space reproduced by the nine loudspeakers surrounding the public (in the 3D version) at different points, to make it easier to hear the dense polyphony of pitches and rhythms. This happens in the bars where the performer plays with four bows to produce four pitches which, combined with their twins in the electronics, give four different differential rhythms that are super-imposed, sustained and combined with the same treatment in successive bars but with divergent differential rhythms on each occasion. Later, the interrelation between frequencies expands thanks to FM (Frequency Modulation), AM (Amplitude Modulation) and RM (Ring Modulation), synthesis models whereby the vibraphone sounds are modulated by the electronic sounds, creating colours characteristic of electronic synthesis. A feature of this section is that the synthesis models are fed back depending on the vibraphone’s intensity of attack, giving the electronic material a live character, generating timbres which are characteristic but which change with each performance, because the electronics’ parameters never vary while the intensities, always relative, variable and peculiar to the percussionist performing the work, do. As already pointed out, both harmonically and formally, the work is based on the instrument’s lowest note, a 174.61 Hz F, the fundamental of a hypothetical spectrum of both harmonics and times which depend on this note and its associated partials; it is successively transposed down- wards and this generates a slow pulsation, so slow that it is perceived as form rather than as rhythm or pitch. Exactly the same thing happens with the remaining harmonics of this F which, depending on their place in the register, take on multiple functions such as pitch, form, duration, tempo or timbre. In the central part of the work, I have developed a flexible treatment of time, but which is extremely precisely controlled so that the pulsation is diluted as it follows an organic flow that expands and compresses microscopically, like a spider’s web that retains its structure but varies without losing its tension. This is a granular treatment, where thousands of sound particles interweave, compress and expand. Lasting 17 minutes, the work is impregnated with a mystical and evocative nature, comparable to a multi-sided crystal that fragments the light in an infinity of celestial reflections. With sound, these reflections are converted into waves and instrumental and electronic textures that surround and hypnotise us: a sonic sculpture in movement, transporting us into an infinite, unearthly space. VibraZoyd was premiered by Miquel Bernat at the Cervantes Institute in Paris on 23 January 2013. Estudio II sobre las modulaciones métricas (Study II on metric modulations) (2003) for four percussionists, commissioned by the Portuguese ensemble Drumming, is an emotive and calculated homage to Elliott Carter and Karlheinz Stockhausen. The composition process involved use of the 12 chromatic tempi contained within a rhythmic octave, and to establish and elaborate the polyphonic situations each of those tempi contains. In other words, to examine and find a way of communicating one tempo with another, to find common points and, through these concealed circuits, to create temporal structures on which to build a personal poetic language based on the idea that in music everything, absolutely everything, from the form to the note, is time. Along the way, I have sought to show the different relative times dependent on the temporal unit characterising that particular state of time and, sometimes linearly or often polyphonically, to show the divisions of the base metronomic unit -that is, multiplying a tempo X by 1, 2, 3, 4, 5, 6, 7, 8, 9, etc… or dividing it by 2, 3, 4, 5, 6, 7, 8, 9, etc. The result is a set of diverse strata of pulses oscillating between approximately 5 and 1000 per minute. A singular aspect of this work is the use of superimposed fixed and variable tempi; for example, a stratum that remains unchanged for percussionist I, along with another three that are compressed and expanded independently between themselves, approaching, distancing and synchronising sometimes with the reference tempo. Depending on the degree of compression or expansion against the fixed tempo, this procedure creates different granular textures that cross over among the four percussionists, giving more the sensation of a moving flexible network rather than of fixed structures. A further feature of the work is the journey toward extremely slow tempi to give the impres- sion of an immense polyphony taking in the extremes and the centre of the pulse (always relative to and depending on our perception), as the pulses referred to, of between 5 and 1000 per minute, can be extended into other fields our perception would lose, in terms of listening, simply shifting the zone of reference from minutes to hours, to weeks, months, centuries, etc… or, in the opposite direction, to milliseconds. Ekphrasis (2001) for marimba, dedicated to the composer Manel Rodeiro, was commissioned by the Laxeiro Foundation in Vigo for the First Enrique X. Macías Contemporary Music Memorial, and was premiered in November 2001 in Vigo by Miquel Bernat. 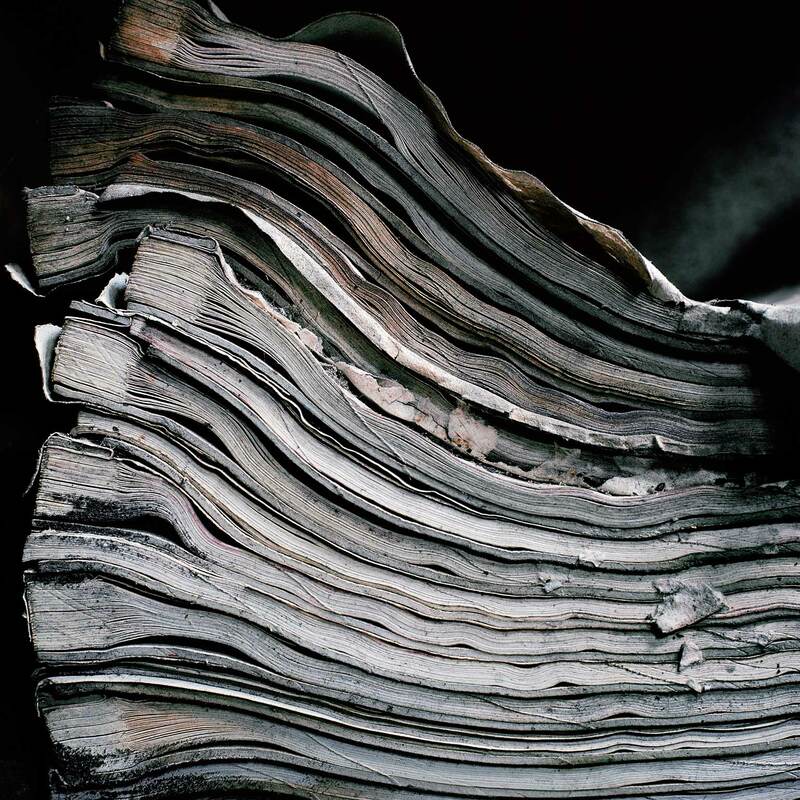 In the poetry of Guillermo Carnero, critical self-awareness of language is projected initially in the non-conformist posture of an onlooker who questions the representative value of visual art works. Ekphrasis has been referred to in connection with Carrero’s first poems, abounding as they do in a minute description of artistic objects and interiors, although in reality their predominantly visual nature is of far greater scope. Thus ékphrasis is limited to presenting approvingly the illusory effects of the art work described: in ékphrasis, the text underlines the stylisation whereby the image, in attaining a serene balance between movement and form, comes to appear greater than life itself. The equivalent in music would be, in Gérard Grisey’s words, the difference between the map and the territory: the score and the sound. Singular in this work for solo marimba is the joining of the technique used in African Winds, spatialising the timbre by points or segments –here closer together because only a solo instrument is involved– and a wish to erase profiles as if in a sonic watercolour, leading largely to the elimination of articulations in certain parts of the work. The listener floats on occasions in an enveloping sound cloud, in reality a spatialised timbre devoid of precise outlines, and at other times, the articulations make themselves present in gestures covering the marimba’s entire register but never settling in fixed form. “My ears have recently been extensively tickled by the sound of percussion, courtesy of “Horizonte Ondulado” (Undulating Horizon), the latest release from the always interesting Neu label, exploring five works for percussion by Spanish composer José Manuel López López. 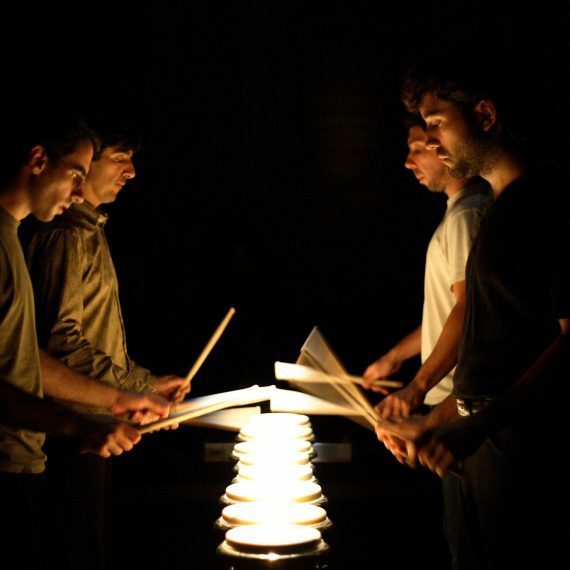 (…) The music itself, performed by percussion group Drumming and Miquel Bernat, is highly engaging, generally concerned with structures demarcated by different kinds of behaviour or texture. (…) What makes “Haikus del mar” so immediate are the gear-shifts that unexpectedly occur throughout, abruptly turning glistening metal into accents and rising scales, and transforming the lightness of maracas and shakers into juddering waves of tam-tams and cymbals. The way the music practically turns to sand two-thirds of the way through, persisting as an entirely granular soundworld, is marvellous, as are the bass drum explosives set off towards the end. Fabulous stuff. (…) The highlight for me is the wonderfully-named “VibraZoyd” for vibraphone and electronics, in which the sound of the vibe is seamlessly integrated with the electronics to create gorgeous shimmering melodies that, depending on your perspective, either sound entirely acoustic or entirely electronic. Only when the instrument becomes more demonstrative, exercised via loud struck accents injected into the material, does the distinction between the two elements become more apparent, introducing a pervading sense of play, the electronics tracing lines and waves in the air like the effect of persistence of vision in the wake of sparks and flashes of light. As elsewhere, López López explores textural aspects here too, taking the music into a place of granular glitter clatter, but the conclusion is the epitome of pitch clarity, a lovely bowed vibe melody embellished with small glissandi on each note, a beautiful effect concluding in a reverberant coda of pitches, each one sounding like an intense beam of bright light. Utterly rapturous.” Read more. “José Manuel López López se mantiene como una de las voces más originales y prestigiosas de la composición española actual.” Read more. “En la escucha del disco ‘Horizonte ondulado’ se percibe una elevada poetización del material sonoro, que es en ocasiones extremadamente refinado. (…) López López es uno de los nombres fundamentales de la creación musical contemporánea española cuando hablamos de estética y compromiso, de indagación y exploración con el material sonoro como punto de partida.” Read more.